With spring just around the corner the resident Canada Geese are making the best of the milder days choosing nesting sights and wooing their mates. 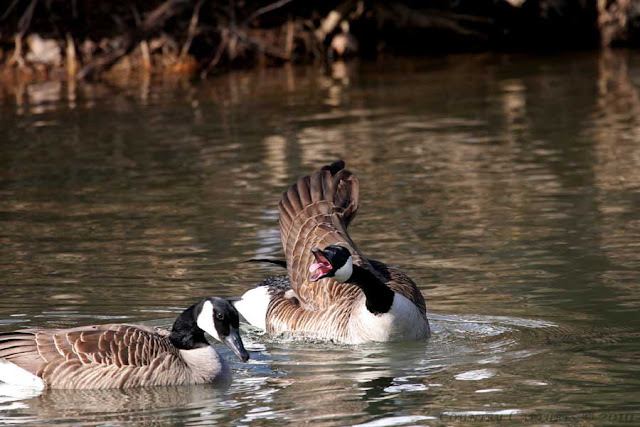 After chasing another pair away from his preferred spot, this gander seemed to have a lot to say to his demure hen. Today we are having typical March weather, high winds and drenching rain. I would have loved to have been photographing the migrating waterfowl today but with the high winds it would be impossible to keep my portable hide erect. Some of the gust passing through seem about to blow our home apart. Ps. After making this post and then changing my template I had not completed all of the fixes that went with the new layout when we lost power. It was nine hours until it was restored and during that time many of you viewed a messed up Country Captures and for that I apologize. If any of you are wondering where I came up with this new template, it is a customized one from the new blogger in draft. For more information visit this post by our friend Abe Lincoln. Beautiful pictures. I really like your new format for the blog. She seems to be saying,enough already. These pictures show the action so well. 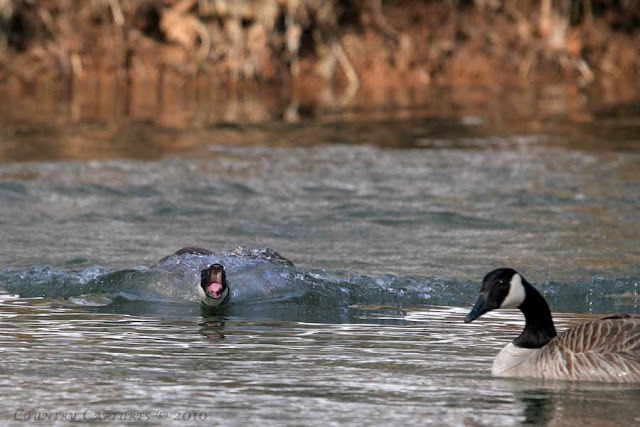 Wow I love the tongue on that goose! Amazing shots, can't believe the tongue! Superb sequence Coy, of a bird we rarely see over here. i love the new design of your blog!! Snap Coy, you with Geese - me with Ducks. Someone certainly has a lot to say. Great action shots. 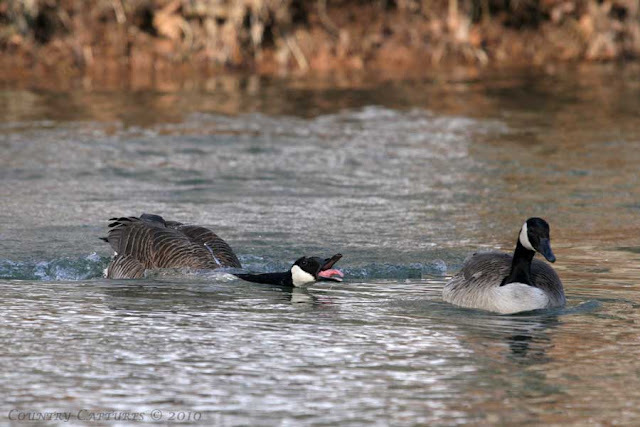 Awesome shots of the Geese! I read your comment about the power outage and figured I would come over here and see how screwed-up you left the blog and to my surprise and pleasure, it looks stunning to me. I really like it. I have been messing around with this place ever since I posted the page about the templates and I still have not hit on one that I really like. I had not seen this one or these colors and I like it very much. I am glad you liked messing around with them too. If you want the banner to fit perfectly, you need to make the picture exactly 900 pixels wide and then it will fit. Or, since it looks to be too wide at the moment, you can go back there and remove the image and then scroll down and make sure there is a check mark in the box that says photos will be reduced to 900 pixels. Then it should fit perfectly. If you don't have any way to change it to 900 pixels you can attach it to email and I can change it and send it back. Glad to help. Beautiful and nature at its finest! Salty: Love the shots, what fun. Your new look is really nice - fresh for spring! The gander really has a lot to squawk about it seems. I don't think I have ever been so aware of a goose tongue before! The header or banner is perfect.